Do you know the first drone or an unmanned aerial vehicle (UAV) was first used by Austria in 1849? This was used to bomb the city of Venice in Italy. Now these were not like drones we see today. They were actually giant balloons loaded with explosives. World has evolved since then and now the drones are deployed in wars and used for pizza delivery as well! Yes, you heard it right. Drone is your new pizza delivery guy! In the era of artificial intelligence, drone innovations certainly have a bright future. According to PwC, a consultancy firm, drone industry will be worth $127 billion by 2020. These intelligent flying robots will mark their presence in agricultural activities, mapping and surveillance services, retail industry, media productions. One of the most constructive applications of drones has been in surveillance services. When Uttarakhand was devastated by floods in 2013, drones were used to assess the damages incurred in the mountainous state of India. IdeaForge, a research and development startup based in Mumbai, used UAVs named Netra for scanning the forests of Uttarakhand during the floods. The mission was successful and IdeaForge was duly recognized for their services. If you are planning to propose to your partner, you can just deliver flowers and chocolates by a drone. If the matter is a bit more serious, you can plan to deliver a diamond ring (of course, drone will steal the limelight!). This will be somewhat unique like a techno-romantic proposal! In the early 90s, roll film cameras were extensively used. After that, digital cameras came into limelight. Nowadays, we are living in the selfie mode. What about the future? Drone is your new partner in crime. Just take the drone, throw it in the air and there you go! Wherever you go, it will follow you and capture all your memories. Drone is not just a flying robot; it can crawl on land like a spider, swim underwater like dolphins and even move like a war tank. 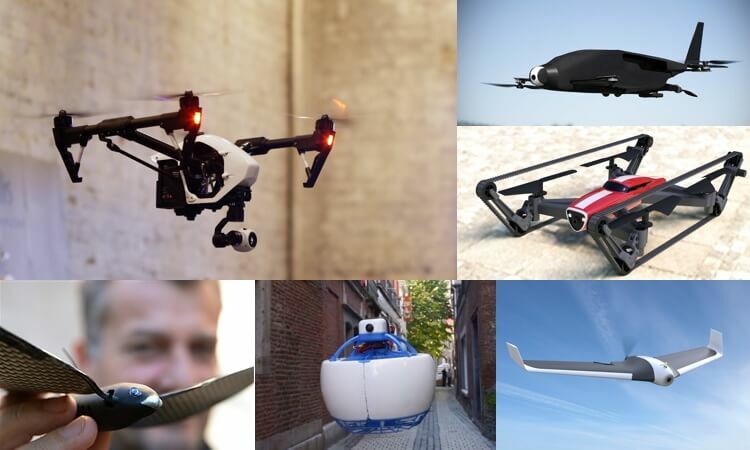 After a lot research, we came across some of the most astonishing and unique drone innovations from around the world. We were definite awestruck by these cool innovations. We bet that for the most of our readers, the next gadget on their list will be one of the drones mentioned here in this article. This is one of the best drones available out there. Its unique feature like Vertical Take-Off and Landing (VTOL) makes it stand out in the crowd. It has two variations- winged blade and hornet. Its top speed is 65 mph and has a high endurance of 40 minutes. That’s why it has a good range of 43 miles. In addition to this, it can carry a payload of 550 grams which makes it suitable for person to person delivery. It also boasts off a camera with an integrated gimbal stabilization (igs) technology which can record 1080 HD videos at 30 frames per second. You wanted to be a bird and see the world with a hawk eye? Well now you can fulfill your dream with Parrot Disco FPV. First Person View (FPV) technology enables you to have a live experience of a flight. Simply place your smart phone in the Parrot Cockpitglasses, and view the live images captured by the 1080 HD camera through FreeFlight Pro application. Maximum speed of 80 kmph and 45 minutes of battery life will provide you a longer and an unforgettable experience. This has the distinction of being the World’s first TankCopter. That means, you will get the dual benefits of a quad-copter and a tank in a single gadget. Weighing only 84 grams, this hybrid quad-copter can counter difficult terrains with ease. It provides a 360° view because it can rotate on the spot. The 900 mAh li-po battery provides an endurance of 9 minutes for driving, 12-20 minutes for flying and a combined endurance of 13-15 minutes. Basically, it’s a reasonable gadget packed with great features, ideal for rough and tough use. It’s quite an interesting story about the Bionic Bird. It all started with the rubber-band bird manufactured in 1960s which was quite popular amongst children. Edwin Van Ruymbeke, creator of Bionic Bird, took over the family business and developed a drone resembling a bird. Weighing just 8.35 grams, Bionic Bird uses micro technology and was designed in France. It can be controlled with The Flying App installed in your smart phone. It has a 100 meter range with a maximum speed of 20 kmph. It draws energy from a portable egg which gets charged in an hour when connected to a computer. CC stands for See the Sea while ROV stands for remotely operated underwater vehicle. CCROV is an underwater drone with a 4K Ultra HD resolution camera for high quality images and videos. It can be used by divers to record video for educational or research purposes. It is made of aluminum alloy and packed in syntactic foam which prevents erosion and withstand pressure up to a depth of 100 m. It is equipped with 6 thrusters which provide it 5 degrees of freedom. It has a battery life of about 1 hour. It is easily portable as it weighs just 4.48 kilograms. Carbon Flyer is world’s first drone made from carbon fiber which can be controlled with a cell phone. It uses a mobile app and Bluetooth 4.0 for communicating with the control device. It provides connectivity up to 80 yards, equivalent to the length of a football ground. It is composed of almost 100% carbon fiber which makes it 100 times stronger than steel. It can achieve a speed up to 640 kmph because of its light weight and aerodynamic structure. We have seen the drones which obviously fly in the air. We have also seen drones like CCROV which operates underwater. Now here comes Loon Copter, which can fly, float and go underwater at your command! When it is in the air, it is similar to other quadcopters. When it lands on the surface of water, it can float on it. When it’s time to go underwater, the ballast tank is filled with water so that it can sink in the waters. Inversely, when it’s time to come up, ballast tanks are emptied and the drone rises on the surface of the waters. This mechanism is similar to that of a submarine. With only one exception that a Loon Copter can travel faster than a submarine! Stalking someone is not cool. But if you are stalked by your own Lily, then of course it is not a problem at all. Yes, Lily is a drone which follows you, wherever you go. You want to capture your video while you are hiking on a mountain, take Lily along with you! It is equipped with 12 megapixels camera which captures stunning images and record 1080 HD videos at 60 fps. Lily is a waterproof drone which can even float on water. It is made of aluminum body and weighs only 1.3 kilograms. It comes with a tracking device to control the drone. It is GPS enabled and 4 GB micro SD card is provided for storage purpose. At first it looks like a small UFO plane, However its a small robust autonomous drone that has on-board dual core Chip running Linux OS. The Compact structure of fleye makes it the safest drone for humans. Fleye can be controlled using our smartphone application (iOS/Android support). It is also equipped with Sensors like Accelero, gyro, magneto, sonar, optical flow, altimeter and GPS that aids developers to build smart software for it and make it futuristic drone. It will be unfair if we dont feature this Hongkong based Drone Company, DJI in this List. DJI is the market leader in drones and aerial photography systems, With its Phantom series it has set a standard in consumer drone technology. The Inspire 1 V2.0 is the perfect combination pf Power, Price and Simplicity. With professional 4K camera and 3-axis stabilization gimbal, This High end Quad-copter can capture professional 360° video footage easily without much effort. Buy Now: DJI Inspire 1 V2.0 on Amazon! With these latest innovations in the field of drone technology, mankind is expected to explore the unexplored and at the same time, take a step towards a sustainable world. I hope you liked this article about the Amazing Drone Innovations from around the world.